The B.A. in Psychology provides broad exposure to the foundational sub-fields of the discipline. Supplemented by training in experimental methods and with options from Philosophy, this major provides insight into the mind and brain and showcases how Psychology interacts with other fields and with our everyday life. *By petition department will accept COGS 14A; SOCI 60 is NOT accepted. **Students who are interested in fields that may require calculus are advised to take MATH 10A or 20A towards their formal skills requirement. 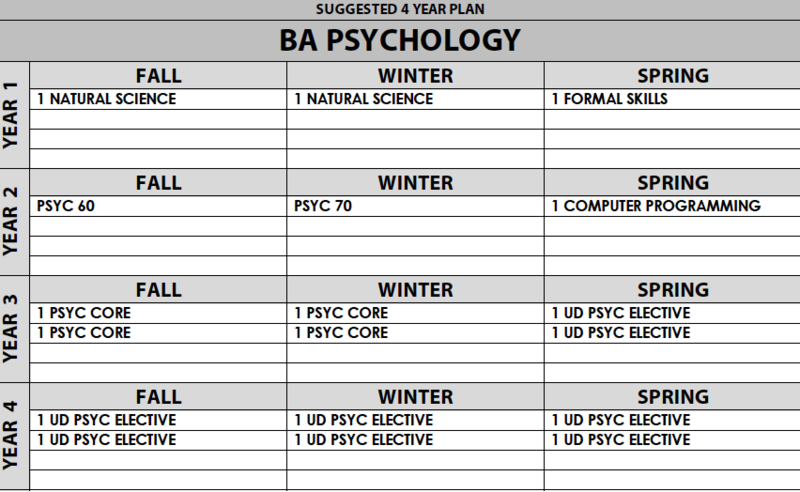 *PSYC 99s/199s do not count toward upper-division Psychology Core or Elective Requirements for any Psychology major. Classes towards the major must be taken for a letter grade. The only exceptions are natural science, computer programming, formal skills, PSYC 195 (up to 1 by petition), AIP 197 (up to 1 by petition).